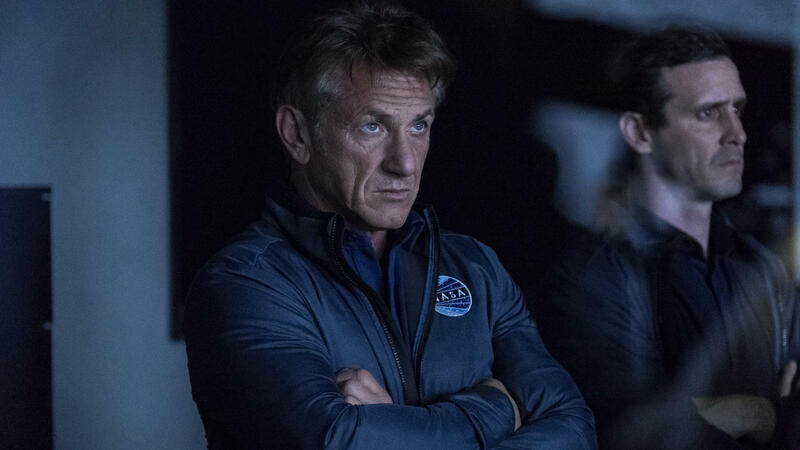 Sean Penn plays a veteran astronaut who aspires to go to Mars in the Hulu series The First. And "launching" is the most appropriate word. Not only because Hulu, which rolls out most of its original shows, like The Handmaid's Tale, in weekly installments, is making all of The First available at once — but also because it's a fictional drama about space exploration, set in the near future of the 2030s. The First is all about the quest to launch the first manned spaceship to the planet Mars. Even more, it's about the people who have decided to design or go on that mission — and their loved ones affected by that decision. The First is created by Beau Willimon, who adapted the British miniseries House of Cards for Netflix, and stayed with it for four seasons. Now, working with Hulu and Great Britain's Channel 4, he's produced a new drama series, whose characters are much more noble than venal. The characters in The First -- from the astronauts and engineers to the visionaries and politicians — are more like the White House staff in Aaron Sorkin's NBC drama The West Wing. Even when they don't always do the right thing, they try to — and while they have flaws, they do their best to overcome them. That's important in The First, because character is what this drama series is really focused on — not the science fiction aspects, which are done superbly but subtly. All slightly futuristic gimmicks, like self-driving vehicles and eyeglasses that share videos, are presented without calling attention to themselves. This is, after all, only about 15 years in the future. And the spaceflight aspects, which you might presume would dominate this series, actually only bookend it. Instead, the core of The First is the relationship between Penn's Tom Hagerty, a veteran astronaut and still-grieving widower, and his estranged daughter Denise, played by Anna Jacoby-Heron. Denise has kept her distance since the death of her mother, and fallen in with a bad crowd and into some serious drug abuse. But when a space launch not involving her father is covered on television, she returns home unexpectedly, in pretty bad physical and emotional shape, to visit him for the first time in a long time. The gulf between them is wide and deep, and The First explains it slowly — at the midpoint of this series, there's an entire episode devoted to an extended series of flashbacks, featuring Melissa George as Tom's wife. Images, paintings and other hints all start coming into sharper focus then — and the slow reveal of the psychology behind all of these characters, is what's most important in The First. Willimon and his team of writers and directors explain things at their own deliberate speed, playing with time and with visuals to make things more clear — but in small doses. It's like watching HBO's Sharp Objects or AMC's Better Call Saul. And since those are two of my favorite TV shows this year, that means I highly approve of The First. It's about a mission to Mars, yes, but in this case, it's not the destination that counts. It's the journey — and the people involved. Penn, for one, is a revelation here. Most of the time, he's a raw nerve, burdened by both his professional and personal responsibilities. But his reactions, for the most part, are held firmly in check. You don't often see or hear his pain and grief, but you constantly feel it. The actress playing his daughter holds her own impressively. The other major players include Natascha McElhone, from ABC's Designated Survivor and Showtime's Californication, who plays a private-sector space-race investor, and LisaGay Hamilton, from ABC's The Practice and from House of Cards, who plays another astronaut. All of these characters have motivations, problems, and families — all of which are explored, just as deeply as outer space. This is FRESH AIR. This Friday, the streaming service Hulu presents eight episodes - the entire first season - of a new drama series called "The First." It's from Beau Willimon, who adapted "House Of Cards" for Netflix. And it features Sean Penn in his first starring role for television. Our TV critic David Bianculli has this review. DAVID BIANCULLI, BYLINE: Sean Penn has acted on TV before. When his father, director Leo Penn, was working in television in the '70s and when Sean was a teenager, his dad got him small roles in a few shows, including a pair of episodes of "Little House On The Prairie." But since Sean Penn became a movie star, he hasn't starred in a TV project until now, when he headlines a new eight-hour drama series called "The First," launching Friday on Hulu. And launching is the most appropriate word - not only because Hulu, which rolls out most of its original shows like "The Handmaid's Tale" in weekly installments, is making all of the first available at once, but also because it's a fictional drama about space exploration set in the near-future of the 2030s. "The First" is all about the quest to launch the first manned spaceship to the planet Mars. Even more, it's about the people who have decided to design or go on that mission and their loved ones affected by that decision. "The First" is created by Beau Willimon, who adapted the British miniseries "House Of Cards" for Netflix and stayed with it for four seasons. Now, working with Hulu and Great Britain's Channel 4, he's produced a new drama series whose characters are much more noble than venal. The characters in "The First," from the astronauts and engineers to the visionaries and politicians, are more like the White House staff in Aaron Sorkin's NBC drama "The West Wing." Even when they don't always do the right thing, they try to. And while they have flaws, they do their best to overcome them. That's important in "The First" because character is what this drama series is really focused on, not the science fiction aspects, which are done superbly, but subtly. All slightly futuristic gimmicks, like self-driving vehicles and eyeglasses that share videos, are presented without calling attention to themselves. This is, after all, only about 15 years in the future. And the space flight aspects, which you might presume would dominate this series, actually only bookend it. Instead, the core of "The First" is the relationship between Penn's Tom Hagerty, a veteran astronaut and still-grieving widower, and his estranged daughter Denise, played by Anna Jacoby-Heron. Denise has kept her distance since the death of her mother and fallen in with a bad crowd and into some serious drug abuse. But when a space launch not involving her father is covered on television, she returns home unexpectedly, in pretty bad physical and emotional shape, to visit him for the first time in a long time. ANNA JACOBY-HERON: (As Denise) I was at this guy's place. And he had it on - you know, on the TV. For a second, it was like - thought about mom, about when we would watch and how scared we'd get when you - you know, even for a second, I was like, what if he's gone? Like, not the thing, but just like, if you were gone, I wouldn't even know. BIANCULLI: The gulf between them is wide and deep, and "The First" explains it slowly. At the midpoint of this series, there's an entire episode devoted to an extended series of flashbacks, featuring Melissa George as Tom's wife. Images, paintings and other hints all start coming into sharper focus then. And the slow reveal of the psychology behind all of these characters is what's most important in "The First." Willimon and his team of writers and directors explain things at their own deliberate speed, playing with time and with visuals to make things more clear, but in small doses. It's like watching HBO's "Sharp Objects" or AMCs "Better Call Saul." And since those are two of my favorite TV shows this year, that means I highly approve of "The First." It's about a mission to Mars, yes. But in this case, it's not the destination that counts, it's the journey and the people involved. Penn, for one, is a revelation here. Most of the time, he's a raw nerve, burdened by both his professional and personal responsibilities. But his reactions, for the most part, are held firmly in check. You don't often see or hear his pain and grief, but you constantly feel it. The actress playing his daughter holds her own, impressively. And the other major players in "The First" are Natascha McElhone from ABC's "Designated Survivor" and Showtime's "Californication," who plays a private-sector space race investor, and LisaGay Hamilton from ABC's "The Practice" and from "House Of Cards," who plays another astronaut. All of these characters have motivations, problems and families, all of which are explored just as deeply as outer space. GROSS: David Bianculli is editor of the website TV Worth Watching and author of "The Platinum Age Of Television: From I Love Lucy To The Walking Dead, How TV Became Terrific." If you'd like to catch up on FRESH AIR interviews you missed, like our interviews with Bob Woodward, John Kerry and chef Jose Andres, who organized chefs to feed people in Puerto Rico after Hurricane Maria, check out our podcast. You'll find plenty of interviews to choose from. FRESH AIR's executive producer is Danny Miller. Our senior producer is Sam Briger. Our interviews and reviews are produced and edited by Amy Salit, Phyllis Myers, Lauren Krenzel, Heidi Saman, Therese Madden, Mooj Zadie, Thea Chaloner and Seth Kelley. I'm Terry Gross. (SOUNDBITE OF STAN GETZ'S "JORDU") Transcript provided by NPR, Copyright NPR.